The last two weeks were crazy. The country is on high alert in the aftermath of the letter bombing attempts targeting members of the Democratic party, the media, and liberals in general. The suspect, Cesar Sayoc, made his first court appearance on Monday. But reports are still coming in from across the country about new suspicious packages. After such a frenzy, it’s important to take some time for reflections. What can we learn in order to move forward with improving our approach to mailroom security? Political beliefs fueled the terrorist attack. With that said, you don’t need to be a political figure to be the target of a political attack. The New York Times reports that there were up to 100 people on Sayoc’s list that authorities believe were targets. If you are a public figure and you have made your personal beliefs and opinions known, an extremist can lump you into that ideological group. Unfortunately that means you could be a potential target for this type of attack. These days, anything you say or do can be permanently tied to you. The internet not only spreads information immediately, but it also serves as a permanent record of your actions and words. Once a threat like this presents itself, the whole country is on high alert. 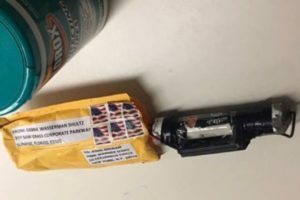 The FBI warned that some of the packages may still be slowly making their way through the mail. There are also many more reports of suspicious packages that are making headlines. This is likely due to enhanced awareness in the aftermath of the letterbombs. The reality is that people report suspicious packages all the time. Those stories don’t always make headlines in calmer times. Finally, there is always a chance for copycat threats in the aftermath of these events. In Billings, Montana, the police had to detonate two suspicious items left outside the local CBS studio building which appeared to be a scare tactic, according to the police Sergeant. Even if the threat isn’t an exact copycat of the letter bombs, being on such high alert gives other terrorists more power in their threats. In California, a police station evacuated after receiving letters with white powder. Police determined the powder was not dangerous after two hours. These incidents always give us a stark reminder to stay vigilant. You don’t need to be on the front lines to be a target for an extremist. With good procedures in place, we can lessen the impact of mail borne threats. Without taking the right precautions, however, you open your mail room and your organization to potential shutdowns or worse. So what reflections should we think about after last week? You might take your own reflections based on your own experiences. Our goal is to help you overcome the gap in mail security that exists today. Best practices, appropriate procedures, and security awareness are some of the tools to help mitigate these threats.